If I could turn back the clock, there are things I’d want to know. But before I’d do that, I’d have to decide which clock to turn back. My office wall clock is now digital as is my bedside clock and would not give me satisfaction in running backwards, but there are other clocks, older clocks. A cherry Grandmother’s Clock stood in my maternal grandmother’s living room, five feet tall, chiming on the quarter hour in the Westminster pattern. It had a golden pendulum and weights, a face with the sun, moon, and stars that tracked the phases of the moon.My paternal grandmother had a much smaller, anniversary clock that sat on top of her maple console television in her double wide. It, too, tracked the phases of the moon under its glass dome. Beneath the face, a mechanism turned like an indecisive golden carousel, first one way and then another, the four golden balls held on small scimitars in constant motion. My parents hung a school house clock in their entry. Its wooden case marking our comings and goings as we grew and finally left the nest. Presently, I have only digital clocks and a couple of watches to play with. In recent years, I’ve even stored the watches and use my phone for time. A professor showed me once how it was mathematically possible to set up molecules in a jar to move to a higher state of order, lower entropy. Time could briefly go backwards, but it was not H. G. Wells Time Machine, nor Dr. Who’s Tardis. And, soon, the molecules returned to increasing randomness and time was on the move again in the right direction. Although I’ve never gone backward in time, except in memory, I have lived months, or even years, in an afternoon. When I am “in the zone,” doing something I love, time speeds by. I am sure this sometimes happens for you. We become Time Lords like the Doctor, Doctor Who. When this zone releases us and we return to those caught in the molasses of ordinary time, we realize that so much more has happened to us than we can explain to anyone who was not with us. If I could turn back the clock, I’d like to talk to my grandparents and great-grandparents. When were they caught up in such ecstasy that time warped and spun and danced at breakneck speed? After we savored those breathless moments together, I’d ask about the family tree. When have you been swept up in ecstasy? Overwhelmed by gratitude or joy? Savor those moments, Time Lords and Ladies. Savor and remember. Jonah reminds me of my mother’s rose garden. Jonah’s task to the Ninevites is a lot like weeding the rose bush bed. He didn’t want to go and I didn’t want to weed. Have you ever been asked to do something that you really do not want to do? Most likely, anyone who has had a parent or a boss has had this happen. When I was young , we had rose bushes on three sides of the yard. All those beds needed weeding. It was too much for my parents alone to do. And, my mother was partially raised by a grandmother and great aunt who had farms who believed that idle hands were a devil’s work shop. This meant that I was obliged to spend some time pulling out Bermuda grass, Johnson grass, and lots of grasses that had no names that I knew. To me they were all weeds. My mother was smart enough to know if I had been lolly-gagging and not weeding my share of the garden. In that case, I was assigned an extra foot or three to weed. Unlike Jonah, I never ran away. I never went AWOL. And, I never got swallowed by a whale. And maybe Jonah did not literally get swallowed by a whale, either. We are not exactly sure how to translate that word from Hebrew that we call ‘whale’ – it means a big fish. The writer of Jonah may have been using being in the belly of a whale as a metaphor – just as you or I, if we were very depressed might say we were trapped in a black hole, or down in a pit, or in the black hole of Calcutta – even if we’ve never been to India. To be in the belly of the whale for three days sounds like a terrible place to be. So what? What does this humorous story have to teach us about ourselves and about God? For as the Word of God – it has a lot to say to us about our lives and about our God. So, where are we in this story? Perhaps you are an unbeliever like the sailors or the people of Nineveh, but probably not. It is a brave unbeliever who comes through the doors of an established church — but it does happen. If so, consider how loving and merciful God is. Repent – and God will save you – for this life and the next. We are most likely the Jonahs of the world, reluctant prophets, running from responsibilities. Perhaps in small ways. Perhaps in larger ways. I can sometimes be Jonah. You can sometimes be Jonah. We may try to run from God and from our responsibilities. But God is always God, always loving and forgiving, even when we hate the people God is forgiving, even when we are cross when God forgives us. 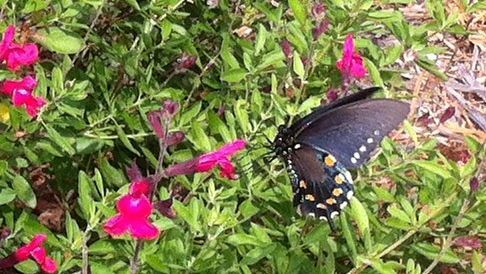 And, we may be cross when having to weed that rose garden, but we can still enjoy the beautiful flowers. For a long time, the red rose has been a symbol of God’s love. It also reminds me of the mercy and forgiveness of God. The concept of being holy is somewhat scary to me but the thought of being useful to God is appealing. What if being holy is like being the right pair of scissors for the job? I couldn’t get by without my scissors. I decided to round up some of the ones I use the most and take a picture for you. And, I started thinking about scissors. 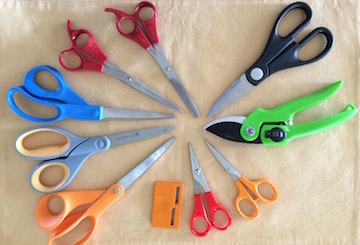 There are different scissors for different tasks we do, just as there are different people who are cut out for different kinds of jobs in the world. 1. Use the right pair of scissors for the job. I learned to never use the fabric shears for cutting paper. If you dull fabric scissors with paper, they might ruin your project by causing runs in the material. If you dull and nick haircutting scissors, the blades will chew and pull hair instead of cutting it. Use the right pair for the right job. And, I’ve found that my clippers do a better job of cutting my roses than my paper scissors or kitchen shears. 2. Take care of your tools. Clean and sharpen them. 3. And, make sure you can find them when you need them. Store them in the right place, kitchen shears in the kitchen, fabric shears in the sewing machine drawer. That is what Holiness is all about, I think. First, we need to understand ourselves, know what it is we do well, what we enjoy doing. Then, we need to understand our purpose. In order to do our best, we need to be clean and sharp. This could mean many things to us, what we study, what degrees we get, how we spend our free time, or even how we care for our physical bodies. It can also mean that we pay attention to all our relationships, making sure that we forgive and are forgiven, as well as making sure that we live honestly and pay our debts. There are so many ramifications here. To stay clean and sharp, we need to pay attention to what we are putting in our bodies and our minds. We need to be in the right place at the right time. And, if we pay attention to these three things, perhaps we can do what we are designed to do: love for God, people, and this world we live in. And, what would this possibly look like? A friend of mine went to lunch with several teens one day. One of them removed the sign from the middle of the restaurant table and put it in her purse. My friend said, “What are you doing?” The young woman said, “I collect these.” My friend said, “That’s not collecting. It is stealing. It is someone else’s property. It’s stealing.” The woman put it back on the table. How many of us would have spoken up? My friend’s understanding of what was right, her living an honest life, and her willingness to speak up made her the right person for that day. Perhaps, her words of sense made an impression on that young woman. For others of us, being holy might be teaching high school, practicing law or medicine, writing computer code, designing bridges, running your own business, raising children, or managing a store. In every place, in every job, everr relationship, God needs people who know the Way to live and act in love. Are you the right scissors for your job? What is your purpose? Do you keep yourself clean and sharp and in the right places? Are you holy like a pair of scissors? Have you been afraid you would never be good enough for God? Some people worry about this, even those who go on to become clergy. 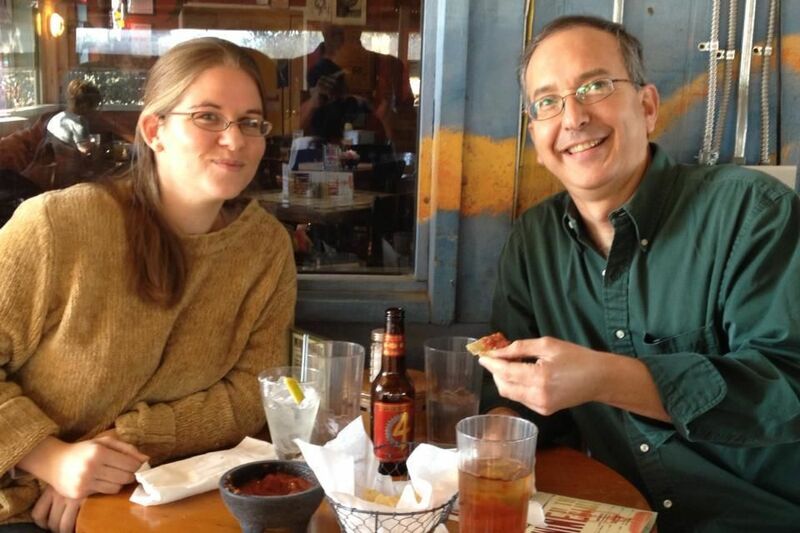 In fact, a clergy friend of mine, who did not grow up in the church, was afraid of church and the Bible because she thought all the people of God were so very good – so very perfect. She thought she could never belong because she was not good enough! When she finally read the Old Testament, it gave her great hope because she found herself saying – “I can do better than that!” She could do better than stealing a birthright and having to escape across the wilderness so that her brother would not kill her. This is just one of many stories about people who made mistakes and yet loved God and were still loved by God. The Bible is full of flawed people, many of whom did things much worse than you ever will. Afraid for his life because of his trickery, Jacob dreamed of a ladder that sat on earth and rose into heaven. This dream gave him great peace and comfort, revealing to him that God was with him, even in the middle of nowhere, even in a site that may have been a sacred place for pagan people. Dreams in the Bible frequently reveal a message from God. There are three messages here: one, God is with Jacob, even in this unknown territory. Two, God communicates through dreams. Three, God’s presence is a blessing. God would stay with Jacob and see him through all the hard times – and there were many. These three things are true for you as well. God is with you. God can communicate with you — sometimes in your dreams. And God’s presence is a blessing in your life. If you want to know more about God communicating through dreams, I commend to you a wonderful book: Dreams, God’s Forgotten Language by John A. Sanford. Sanford says that God is still communicating with us. When we are too busy or distracted to listen, God sends us dreams. Just as my tile path through my backyard is broken, our lives can also be broken. We are not perfect but we are good enough. This path is good enough to provide a place to walk so that our shoes do not get muddy in those rare occasions that it rains here at the edge of the Wild Horse Desert. 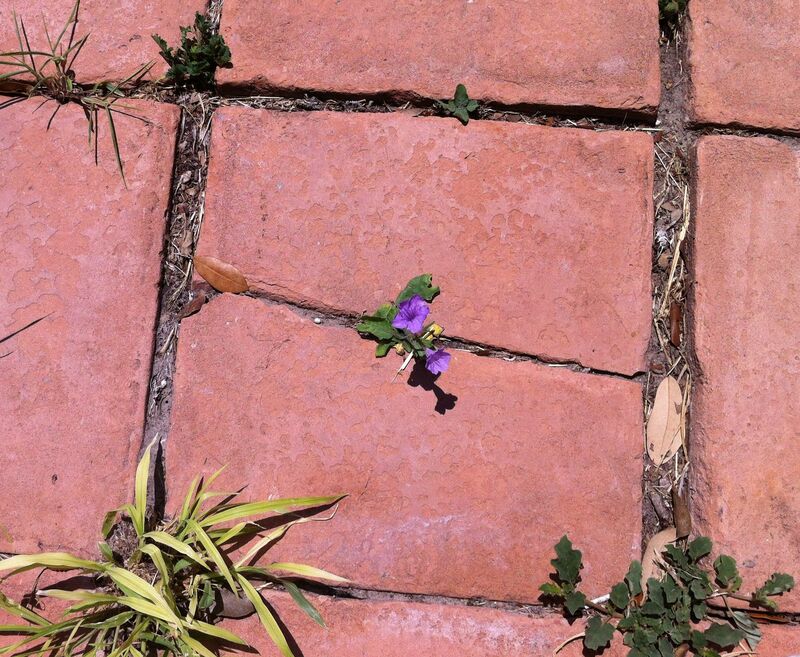 The crack in this tile has allowed a small and delicate flower to grow and delight the eye. Your cracks and imperfections may allow something just as delicate to delight those around you. Perhaps that crack is what God will use to bring you a message. Do not be intimidated! You, my friend, are good enough! 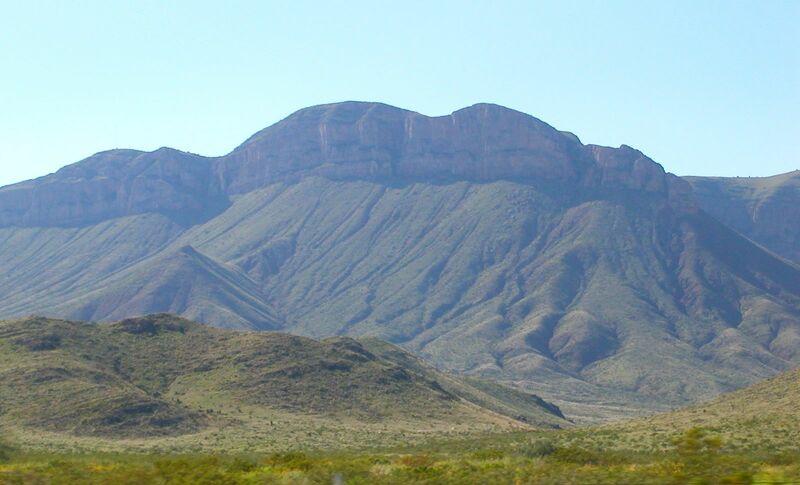 It is the middle of summer and the temperatures in South Texas are up to 99, 100, and sometimes more. This is all the more noticeable to me since returning from a stay in the coolness of the mountains of Colorado. We are encouraged to be grateful for all things – even the heat. Gratitude changes our lives and dispositions, and in doing so changes not only the quality of our life but the quality of life for all those around us. I hope you enjoy this meditation on being grateful for the heat. Please visit it and enjoy. If you are receiving this by email, you may need to click on the title of the post above in order to click through to this lovely meditation in words and images. Taking the Heat and saying Thank You. Perhaps it is not the heat you struggle to be grateful for. What might it be? I have just finished reading a memoir by Barbara Ehrenreich named Living with a Wild God. She has written several important books, some used in sociology classes, such as Nickled and Dimed in America, a book about how difficult it is to live on a minimum wage. In her spiritual memoir, Living with a Wild God, she talks about a lifetime of spiritual experiences that she cannot explain with her scientific background and at the end of the book asks that the scientific community not give up on investigating spiritual experiences or the question ‘why’ which she says really means ‘who.’ And this who, she says, seems to be pursuing us. There are several things about this statement and the memoir that are interesting, not the least of which is that the author is an atheist and a scientist. She does not think that she can call this being, if it is a being, “God” because she thinks that we have outgrown notions of “gods.” Her experiences as she has tried to search for the truth do not fit into any framework that she has for understanding the universe. And, yet, she will not deny them because she knows what she has experienced. This intelligence that she encountered in experiences that are almost impossible to explain in words, is not the God that she has heard spoken of so casually. However, this sounds a lot like the Living God, “I Am” of scripture. This was not a small, easily explained, loving presence that fits neatly into a box but an enormous light-filled power. These are experiences that can be frightening in their otherness. Last Sunday, we read the account of Abraham taking Isaac up onto the mountain to sacrifice him. I am wondering if Abraham’s encounters with this Wild God were equally as frightening and impossible to put into words as the encounters of Ehrenreich. Are we, who love to explain everything, who love to test and measure everything, putting forth too simplistic a view of God? I am inclined to think so. I had one seminary professor, who would say that we should remember that God is larger than our God. And, our theology professor, Alan Lewis, began our course in theology with the thought that with God being so large and other, existing before time and space, how could we even find words to express ‘who’ this God is, a being so totally other. He equated it to being like a jester. And, yet, for those of us who have been drawn into the service of the living God, we must continue to try to express what we can and do know. Ehrenreich approached life with a desire to know the Truth about life and its purpose. She encountered this “Other” in the desert as a young teen after dedicating herself to the pursuit of Truth and has spent her life working for peace and justice. It seems to me that she met the God whom I serve and whom she has served as well. My greatest teacher I have only met in writing said, “whatever you do to the least of these, you do to me.” Ehrenreich has been concerned with being the voice of the marginalized and the defender of the poor and forgotten. This life of service to humankind grew out of her search for the Truth and purpose of life. I recommend reading the book. She may open your eyes to the Wild God, the God who is bigger than all we know of God, the God who comes (Carlo Carretto) and is pursuing a relationship with you and me and everyone. I read an article a few years ago that stated that perhaps atheism is the new normal for the future. It has been fashionable to ask atheists, “What god do you not believe in?” because you and I probably do not believe in that god either. You know the gods, the ones who strike people down with cancer or send a tornado through their house because they said a bad word or killed them and their friends because they’re gay. I don’t believe in those gods. And, I don’t believe in the god who keeps a naughty and nice list and heaps gold and material possessions on those who send money to TV ministries. However, that question: “What god do you not believe in” has lost its power in repetition. I would no longer ask it. I am considering just how to speak and talk to those who profess no belief in God. And, I’m considering how to be welcoming and loving to those who hold to that belief. What many non-believing people seem to not realize is that a belief in no god is as much a belief as a belief in God. And, furthermore, this belief will inform the actions of those who hold it, just as our belief in a God of love, peace, and justice will inform ours. One of the characteristics of a Christian community since the beginning is love and the care that we take of each other. It was out of the Christian communities that hospitals, hospices, and hotels were formed. Because of our belief that God will provide for us even after death, we can care for those with illnesses that might cause our own death or disfigurement. Because of our understanding that God loves and redeems, we work for restitution for those who have been harmed by others and also for rehabilitation of criminals. We collectively do all these things even though I do not personally do them. Perhaps we might invite them to join us in service. Have a hammer? Want to help build a wheelchair ramp? Want to mentor in the schools? How about helping these ladies bring in the clothes bags and sort them for the clothes closet? Or, invite them to a meal. We all eat. How do we help people who come seeking a sense of the holy when they do not even know they are looking for it? How do we extend love and acceptance to people who do not realize they need it? Many people are turned off by Christians these days, even repulsed and perhaps, rightly so. Throughout history, people have had varying problems with the church, with the wealth gathered from the poor to build beautiful cathedrals, with the wars fought against Muslims or Jews, or with the fracturing of the church into many denominations. There are so many ways we can become arrogant, so many ways that our actions do not match our faith. It seems to me that many of the dialogs between prominent atheists and Christians have not been satisfying. Perhaps talking is not the thing to do after all. Maybe a project and a meal.